A pretty, manicured home sits six doors down from Phil Faranda's in Briarcliff Manor, N.Y.
To look at it, most passersby would think that the tidy house is occupied by a nice family that gives it a good amount of TLC: The lawn is mowed, the bushes trimmed, and the siding has what looks like a fresh paint job. The bank-owned house (pictured above) has been vacant for 18 months, according to Faranda, a Realtor specializing in distressed properties. 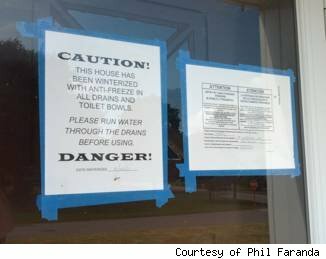 Just two notices taped to a window are the only indications that the home is unoccupied. 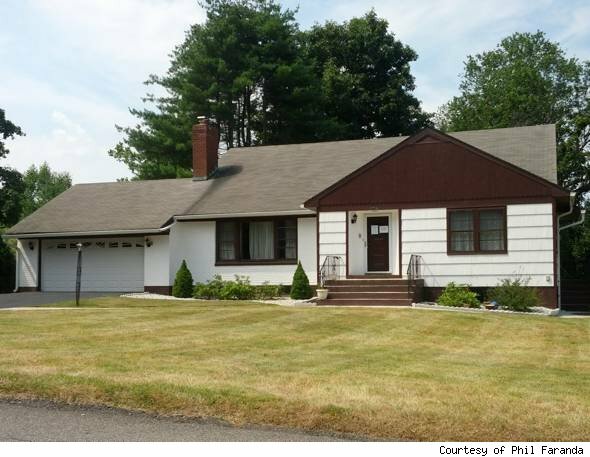 It might seem curious that such a well-maintained home doesn't have a For Sale sign on its front yard. But it's certainly not unusual. This home is part of what's known as the "shadow REO" inventory: repossessed homes across the country that banks or investors often purposely keep off the market. The practice isn't a secret, and refraining from dumping a large inventory of foreclosures on the market helps to keep home prices from crashing. But the extent to which lenders keep their stock of REOs -- industry parlance for "real estate owned" properties -- off the market may be much larger than most people think. As many as 90 percent of REOs are withheld from sale, according to estimates recently provided to AOL Real Estate by two analytics firms. It's a testament to lenders' fears that flooding the market with foreclosed homes could wreak havoc on their balance sheets and present a danger to the housing market as a whole. Online foreclosure marketplace RealtyTrac recently found that just 15 percent of REOs in the Washington, D.C., area were for sale, a statistic that is representative of nationwide numbers, the company said. Analytics firm CoreLogic provided an even lower estimate, suggesting that just 10 percent of all REOs in the country are listed by their owners, which include mortgage giants Fannie Mae and Freddie Mac as well as the Federal Housing Administration. As of April 2012, 390,000 repossessed homes sat in limbo, while about 39,000 were actually listed for sale, said Sam Khater, senior economist at CoreLogic. Daren Blomquist, vice president of RealtyTrac, said that he was surprised by his company's finding, especially since a similar analysis in 2009 found that banks were attempting to sell nearly twice as much of their REO inventory back then. "It was surprising to see that that percentage had come down," he said, noting that many agents that his firm has spoken to "have mentioned that there's actually a shortage of foreclosure inventory -- and they're wanting more." But Realtors who want more bargain-priced homes to sell may not get their way anytime soon. Foreclosed properties are an extreme liability to lenders, holding the potential not just to dent their profits but to actually bankrupt them altogether. That's because when a lender carries an REO on its books, it is allowed to value the home at the price that the foreclosed-on borrower originally paid for it. Once the lender sells the home, it must book a loss: the difference between the original purchase price and the current value. And since home values have fallen by nearly a third since the housing bust, that translates into huge losses for the bank. "They've already taken a loss on the loan," Khater said, "but they're going to take a loss on the asset once they dispose of it." Adding insult to injury, REOs typically sell at a 33 percent discount. Releasing REOs onto the market also chips away at home prices in general, depressing the value of the homes of other customers -- who could already be teetering on the brink of foreclosure -- and the additional REOs that lenders hold on their books. "Each REO that comes through has a domino impact on properties that are very close to that property," Khater said. In fact, if lenders turn their REO release valve to full blast, the deluge of foreclosures cascading onto the market could plunge the country into a recession, said Thomas Martin, president of consumer advocacy group Americas Watchdog. "If they let the dam essentially break. It could be a catastrophic disaster for the U.S. economy," he said, predicting that some major banks would fail and home prices would nosedive by 20 percent. That doomsday scenario has many industry professionals supporting lenders' tactics of holding onto most of their REOs. Otherwise, they would be "causing the floor to fall out from underneath the entire market," Faranda said. He added that banks don't have the manpower to push the paperwork required to put all their foreclosures on the market. Indeed, lenders couldn't list all their REOs even if they wanted to. Fannie Mae, for one, reported in the first quarter of 2012 that it was unable to market 48 percent of its REO inventory because many of the homes were either still occupied, under repair or being rented. Banks and investors will likely continue to withhold REOs until the market value of the properties appreciates, allowing them to sell the homes at higher prices. And that may be a winning strategy. Fannie Mae, which owned 114,000 foreclosed homes as of March 31, reported in the first quarter that there were "improved sales prices on dispositions of our REO properties, resulting from strong demand in markets with limited REO supply." But at the same time, battening down REO inventory could prolong the housing slump, since the market must absorb the properties at some point anyway. "As opposed to ripping off the Band-Aid quickly, it's kind of slowly pulling back the Band-Aid," Blomquist said. Either way, he said, many lenders' REO-disposal tactics remain obscure, and that will continue to "create a lot of uncertainty in the market." Median home prices in the Orlando area fell by 54.2 percent from their peak in the second quarter of 2006 through the end of 2011. Of the 50 most populous metro regions in the U.S., the Orlando-Kissimmee area has the tenth highest foreclosure rate in April, of one in every 347 homes. Orlando had 2,717 new homes in foreclosure this past April, up 12.9 percent from the 2,406 in April 2011. The forecast for the future is similarly bleak. Fiserv projects Orlando homes to continue to lose value between the fourth quarter of this year and the fourth quarter of 2013, predicting a 1 percent decline in prices over that time period. See foreclosures for sale in Orlando and Kissimmee, Fla.
From their peak in early 2007, home prices in Chicago fell 36.8 percent through the end of 2011. In April, the Chicago-Naperville-Joliet metro area had the largest number of new homes in foreclosure among the 50 largest MSAs, at 11,840. This represented an increase of 25.5 percent from April 2011 when 9,433 homes entered foreclosure. However, the number of foreclosures represents a 7.63 percent decline from March, when the Chicago area also led all metropolitan areas with 12,818 foreclosures. Another positive sign for Chicagoans: Home prices are projected to rise 6.3 percent annually through 2016, according to Fiserv. See foreclosures for sale in Chicago, Naperville and Joliet, Ill. Residents of the Tampa, Fla., metro area watched the median home price in the region fall to $137,000 in the fourth quarter of 2011 -- a 48 percent drop from its peak. The region recorded 4,295 foreclosures in April 2012. To make matters worse, that number is up from the April 2011 figure. Then, only 2,701 homes in the area were new to foreclosure, meaning that foreclosures increased by 59 percent in the past year. One in every 315 homes in this MSA had a foreclosure start this past April. See foreclosures for sale in Tampa, St. Petersburg and Clearwater, Fla.
Home prices in the Phoenix region -- the country's twelfth-largest metropolitan area by housing units -- declined by 56 percent from their 2006 peaks through the end of 2011. Although this accounted for the third-largest decline in home prices among all metropolitan areas, the Phoenix region posted a 22.64 percent decline in foreclosures from March, as the number of new foreclosed homes fell from 7,439 to 5,755. Likewise, in the last year, the number of foreclosure starts in the area fell by 44.44 percent, from 10,358 in April 2011 to 5,755 this past April. See foreclosures for sale in Phoenix, Mesa and Scottsdale, Ariz.
Home prices in the Salt Lake City area declined by roughly 20 percent from their peak in 2007 to the fourth quarter in 2011, which is a modest decline compared to other regions on this list. Nevertheless, foreclosure rates were higher than all but five of the largest metros in the country. Compared to the 1,406 foreclosures in April of 2011, April 2012's foreclosures declined by 5.7 percent. This metro area is one of the few on the list that analysts are bullish about; home prices are projected to increase by 9.5 percent from this year's fourth quarter to the fourth quarter in 2013. See foreclosures for sale in Salt Lake City. the median price of these homes was just $110,000 in the fourth quarter of 2011. To make matters worse, the area's April 2012 foreclosure figure was a staggering 7,271 homes -- the fourth most among the nation's largest cities. Things may be on the upswing though -- since the number of homes in foreclosure fell by 11 percent from the prior month. See foreclosures for sale in Atlanta, Sandy Springs and Marietta, Ga. The first California metropolitan region on this list, the Sacramento-Arden-Arcade-Roseville area had one in 277 homes in foreclosure in April. With home prices down 54.7 percent from their high at the end of 2005, the Sacramento area registered the fifth-largest decline in home prices. The area had the twelfth-most foreclosures in the U.S. However, foreclosures are down by 39.01 percent from last year, when April 2011 had 5,160 homes in foreclosure. Additionally, the number of foreclosures also decreased by 26.7 percent from the previous month, from 4,294 to 3,147. Fiserv expects home prices in the area to rise 6.3 percent annually through the fourth quarter of 2016. See foreclosures for sale in Sacramento, Arden-Arcade and Roseville, Calif. The Miami metro region topped all Florida regions in the number of new foreclosures. It also ranks third in new foreclosure rates among the 50 largest metros with 9,031 foreclosures in April, 2012 -- a rate of one in 273. While foreclosures in the area decreased between March, 2012, and April, 2012, to the tune of 9.2 percent, the future appears gloomy. Prices in this region are forecast to fall another 3.8 percent between the fourth quarters of 2012 and 2013. See foreclosures for sale in Miami, Ft. Lauderdale and Pompano Beach, Fla.
Home prices in Las Vegas, the poster child of the housing crisis, plunged by 61.8 percent from their peak in early 2006 through 2011 -- the greatest decline of any of the nation's 50 largest metros. Although new foreclosures in the Las Vegas-Paradise region declined by 66.1 percent to 3,378 over the past year, the number of foreclosures in April represents a slight increase over March, when 3,301 new homes were in foreclosure. Making matters worse, prices are expected to fall by another 3.3 percent between the fourth quarter of 2012 and the fourth quarter 2013, according to Fiserv. See foreclosures for sale in Las Vegas and Paradise, Nev.
As of the fourth quarter of 2011, prices in the Riverside metro area fell by 56.6 percent from their peak, the second largest drop among top-50 metros. In addition, this region is first in terms of now foreclosure rate, at one in 213. While the number of homes (1.5 million) ranks 14th of the 50 largest regions, the area's new foreclosure count for April, 2012, reached 7,049 -- fifth highest overall. 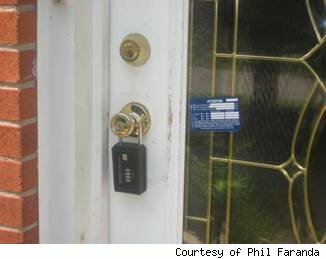 It appears, however, that, the situation is improving; between March 2012 and April 2012, foreclosures dropped 10.8 percent. See foreclosures for sale in Riverside, San Bernardino, and Ontario, Calif.